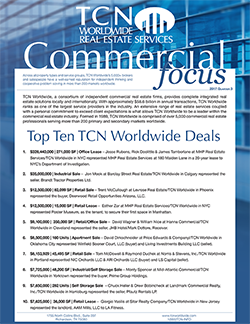 Commercial Focus, Q4 2018: Top TCN Worldwide Member Deals! $29,500,000 | 256,202 SF | Industrial Sale – Ronald Kassan, Dustin Tondreau, Arthur Minassian, and Garret Houghton at Beitler Commercial/TCN Worldwide in Los Angeles represented both parties, Rexford Industrial (Buyer) and Allegretti & Company (Seller). $22,500,000 | Parking Garage Sale – Ford Price of Price Edwards & Company/TCN Worldwide in Oklahoma City represented the sellers, Continental Resources and BancFirst. $19,950,000 | 95,546 SF | Self Storage Sale – Pam Arms at Mid-Atlantic Commercial/TCN Worldwide in Yorktown, VA represented the buyer, Prime Group Holdings. $17,000,000 | 285,924 SF | Industrial Sale – James Autenreith at Moody Rambin/TCN Worldwide in Houston represented both the buyer and seller. $16,360,000 | Land Assemblage – Michael Cheney and Willie Ellington at Richard Bowers & Co./TCN Worldwide in Atlanta represented the sellers’ side, consisting of 119 separate sellers, to complete this transaction. $15,250,000 | 117,332 SF | Office Sale – Todd VanDomelen, Tim Mitchell, and Tim Pfeiffer at Norris & Stevens, Inc. /TCN Worldwide in Portland represented the seller, Stonemill Business Park, LLC. $12,101,765 | 124,450 SF | Office Lease – Greg Nesting and Gabe Schnitzer at Norris & Stevens, Inc. /TCN Worldwide in Portland represented the tenant, Rockwell Collins, Inc.
$11,750,000 | 59,886 SF | Office Lease – Craig Tucker at Price Edwards & Company/TCN Worldwide in Oklahoma City represented the tenant, Ackerman McQueen. $11,000,000 | 27,000 SF | Industrial Bldg/Land Sale – Ed Wabick and Terry Lynch at PW Commercial/TCN Worldwide in Chicago represented the seller, Wabash Avenue Properties. $9,857,142 | 33,000 SF | Retail Sale – Barry Silver of The Silver Group with Beitler Commercial/TCN Worldwide represented the buyer and seller. 24 Hour Fitness long term lease. To download the PDF version of TCN Worldwide’s 2018 4th Quarter Edition of Commercial Focus, click here. $7,938,000 | 22,000 SF | Office Lease – Steve Wray at Carolina One Commercial/TCN Worldwide in Charleston represented the tenant, JW Aluminum. $6,637,130 | 50,224 SF | Office Lease – Jason Grace and Tom Posavec at Landmark Commercial/TCN Worldwide in Harrisburg represented Mountaineer Properties, LLC (Landlord) and Transcore, LP (Tenant) respectively. $2,772,000 | 3,000 SF | Retail Lease – Greg Vanlerberghe at Levrose Real Estate/TCN Worldwide in Phoenix represented the tenant, Farmer Boys Food, Inc.
$2,720,000 | 9,000 SF | Retail Sale – Danielle Davis at Levrose Real Estate/TCN Worldwide in Phoenix represented both the buyer and seller. $2,330,000 | 58,370 SF | Retail Sale – Todd VanDomelen at Norris & Stevens, Inc./TCN Worldwide in Portland represented the buyer, 2275 W Burnside, LLC. $2,300,000 | 10,585 SF | Retail Sale – Gregg Waller at Long & Foster Commercial Division/TCN Worldwide in Vienna, VA represented the buyer, The Springs Inc.
$29,500,000 | 256,202 SF | Industrial Sale – Ronald Kassan, Dustin Tondreau, Arthur Minassian, & Garret Houghton at Beitler Commercial/TCN Worldwide in Los Angeles represented both parties, Rexford Industrial (Buyer) and Allegretti & Company (Seller).